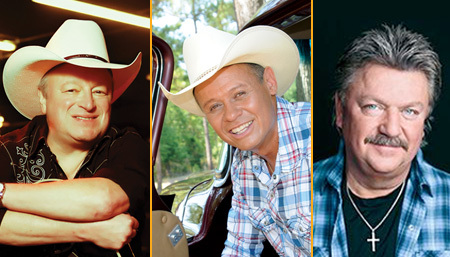 Three of Country's legends come together for one night of Country classics "unplugged"! Mark Chesnutt has had 4 platinum albums, 5 gold albums, 14 #1 singles, and 23 top ten singles to his name. His trademarked voice has shaped the music of today's country music newcomers and the new country music generation. Neal McCoy has over 5 million albums sold, is a two-time Entertainer of the Year, and has 3 platinum albums. He's a one of a kind humanitarian and pillar in the country music community. Joe Diffie has 12 #1 hits and 20 top 10 hits, and albums with sales exceeding 6 million. He's a Grammy and CMA award winner and a member of the Grand Ole Opry. Diffie has one of the most recognized voices in country music.